This is the next level up from the 1mm and 1.5mm, and is the entry level of the heavier chains in this series. This weight and diameter has a nice substantial feel without being overbearing, and can still fit through most pendant bail openings. 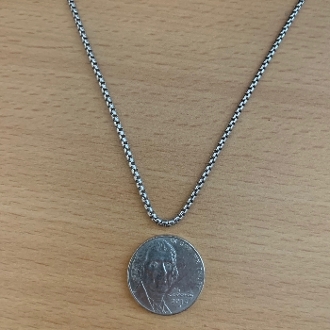 Men and women like this chain when a hearty look is desired, but still can be classified in the "medium" category of chain weights and appeal. The chain does begin to be a part of the "setup with a pendant" in a visual sense, and begins a look that increases in this regard as the diameter increases in the 2.5mm and 3.5mm examples also offered in this series. 2) This link construction is less likely to snag finer hair strands which can roll up in some snake type chains and others. All chains bear soime potential of this by nature, yet these are on the low spectrum scale of this problem. 3) This chain type is also much less prone to “kink or bind” which avoids chain glitches and weak spots that can arise from travel and handling issues. Kinks create weak spots for later breakage under stress.